Norsafe, a globally renowned supplier of lifeboats showed a comprehensive range of its renowned safety craft at Posidonia which took place earlier this month. Exhibiting in partnership with its Greek agent, Intra Mare, the Norway-based manufacturer together with its Greek subsidiary Norsafe Watercraft Hellas showed a mix of rescue boats, conventional lifeboats and smaller free- fall models. Due to market requests, Norsafe has undertaken extensive work to improve release gear for lifeboats which has resulted in the newly updated TOR MKII on-load release hook. The new design overcomes premature release issues and the highly visible yellow padlock, which can be seen on both sides of the hook, clearly indicates that the hook is set and release cables are correctly located. Even when the cables are disconnected, the hook is able to stay closed in the most extreme load conditions and has been tested to 7.5 x SWL with no damage to the hook. Another new design is the GES 21, a totally enclosed lifeboat taking up to 26 people. 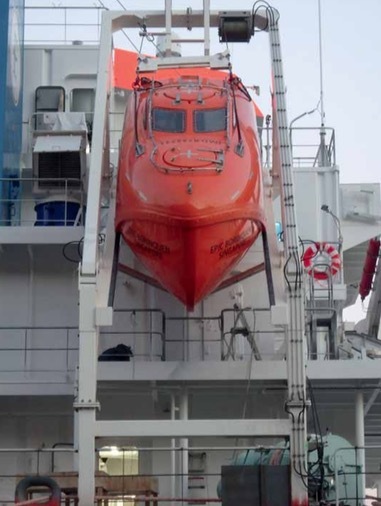 This model was designed following requests from customers for a compact high specification quality life craft and is suitable for all ships that use free-fall lifeboats including LNG, chemical and dry bulk vessels. The GES 21 can be launched from a hydraulic ramp which ensures the boat enters the water at a safe distance from the mothership. All Norsafe’s vessels are manufactured in accordance with the latest SOLAS requirements backed up with a 24/7 service network providing maintenance from over 300 ports worldwide. The company has the widest range of rescue boats, davits, conventional and freefall lifeboats in the market today and has complete design flexibility making it possible for boats to be built to meet specific clients’ needs. Norsafe Group has its headquarters in Arendal, Norway and the company has a worldwide involvement that includes production, sales, delivery and service of lifesaving equipment for ships and to the offshore industry. Norsafe has its own production and sales/service companies in Norway, China, Greece, Mexico, Singapore, South Korea, Australia, USA, UK, Japan, Brazil and the Netherlands. In addition, Norsafe Group has a network of 45 authorized service partners spread across all continents. Norsafe Academy offers courses and training, STCW/OLF & OPITO, and is currently expanding its network. Norsafe is continually growing, and new daughter companies and service stations are being planned/developed.